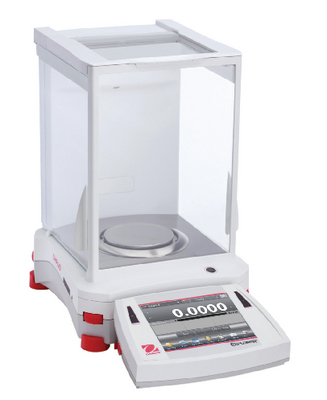 Explorer Analytical Balances are ideal for labs requiring the utmost precision. These balances provide maximum stability for sensitive chemistry and lab applications. A draft shield made of antistatic-coated glass protects samples from disruption while it provides ample access to the weighing chamber. The ergonomic design features a color-touch display that can be separated from the base. Intuitive, easy-to-use graphical software features 14 applications with virtual QWERTY and numeric keypad for precise parameter input and dependable results. Weighing units include gram, milligram, kilogram, carat, ounce, pound, pennyweight, Newton, grain, Mommes, and more. Ordering information: Two-year manufacturer's warranty is included with purchase.